Emily recorded a short video telling why she loves horse. It is part of a contest and the video that gets the most votes will win. Please vote for Emi and share ☺ This is her video. 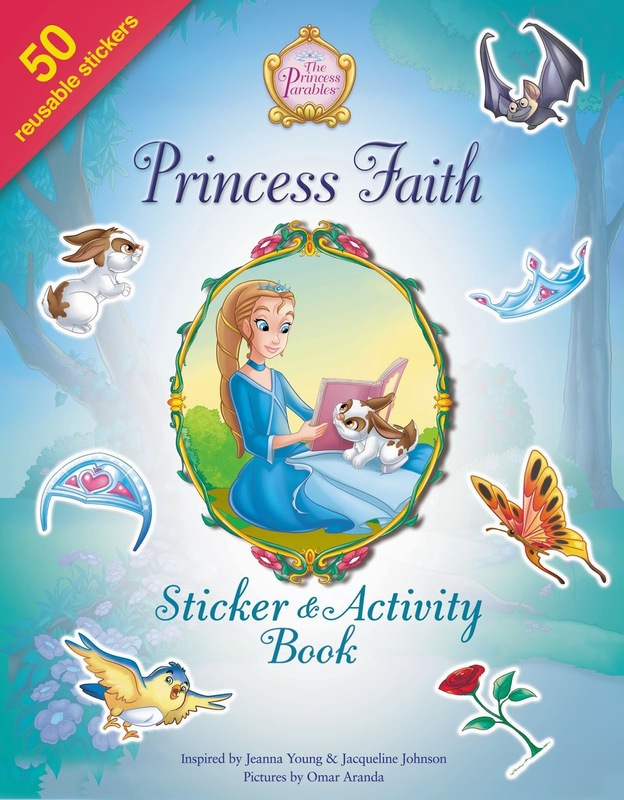 Book Review: "Princess Faith Sticker & Activity Book"
"Princess Faith Sticker & Activity Book" follows Princess Faith and her pet Buttercup Bunny and her garden. There are 16 pages of activities including: maze, coloring, word search, spot the differences, color by number, and others as well as 2 sheets of reusable stickers. The stickers stick to any of the pages and are easily removable and then restick to another place. 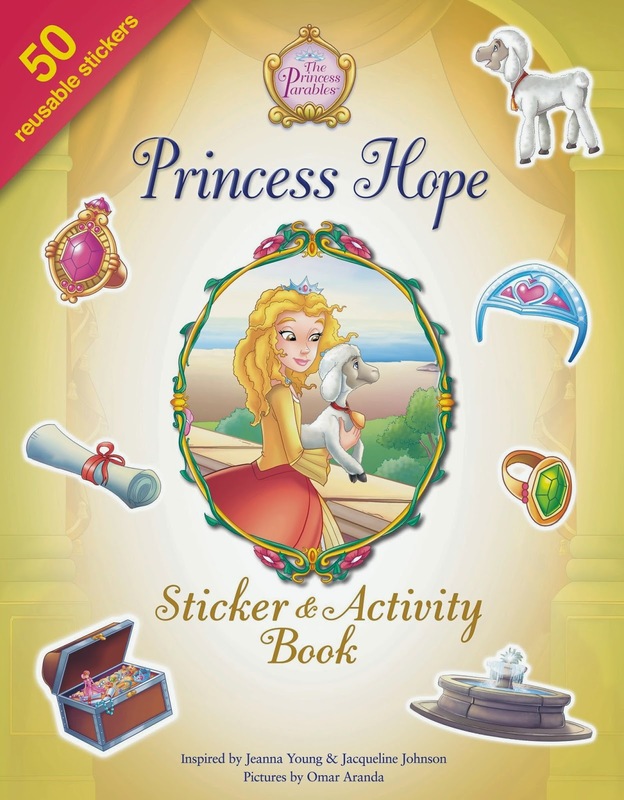 Book Review: "Princess Hope Sticker & Activity Book"
"Princess Hope Sticker & Activity Book" follows oldest sister Princess Hope and her pet Lily Lamb and the lost ring. There are 16 pages of activities including: dot to dot, coloring, word search, spot the differences, color by number, and others as well as 2 sheets of reusable stickers. The stickers stick to any of the pages and are easily removable and then restick to another place. "The First Easter Ever" tells of Jesus' baptism and Earthly ministry. It shows Jesus praying in the Garden of Gethsemane, his arrest, and beatings. It tells how they put Him on the cross to die, but it does not show it other than a partial sideview, so it isn't gruesome for younger children. The book then tells of the burial and resurrection of Jesus. I was disappointed in the line about what happened when the angel came down from heaven. It says, "The soldiers did not know what to do! So they ran!" In Matthew, it says that they trembled from the fear of him [the angel] and became like dead men. The book finishes by telling of Jesus appearing to the disciples, giving the Great Commission, and his ascension into Heaven. The illustrations are very colorful and cartoon-like. They would be appealing to children. I liked how the book included the earlier parts of Jesus' ministry even though it was called "The First Easter Ever". I would recommend this book to those who have or work with children. I received a free paperback of this book from Zonderkidz to review through their zblogsquad. All opinions are my own. 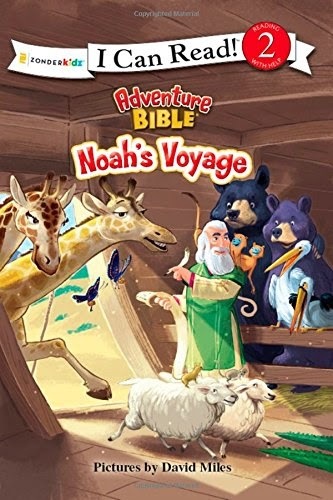 Book Review: "Adventure Bible: Noah's Voyage"
Zonderkidz' Adventure Bible I Can Read series is based on the Adventure Bible and illustrated by David Miles. "Noah's Voyage" tells the story of Noah. I was glad that it told how God brought the animals to the ark since that is what it says in the Bible. One thing I wondered about, though, was that it said that after the animals and Noah and his family were on the ark "God closed the window tight". In the Bible, it mentions that God closed the door. I like having books that I can let my children read and know that it is teaching truth. It is a Level 2 reader which stands for "Reading with Help-high interest stories for developing readers". The illustrations were beautiful and reminded me of colored pencil pictures. Many of the pages are completely covered with color making the book visually appealing. There was one picture I didn't like as it shows that suddenly the whole side of the ark is covered in windows and the animals have their heads sticking out. This is more the modern rendition of the ark and I didn't like seeing it in the book that followed the Bible otherwise. At the end of the book is a "People in Bible Times" section that tells a little bit more about Noah and a "Did You Know?" section that tells about the size of the ark. I would recommend this book for those with young children in their lives. 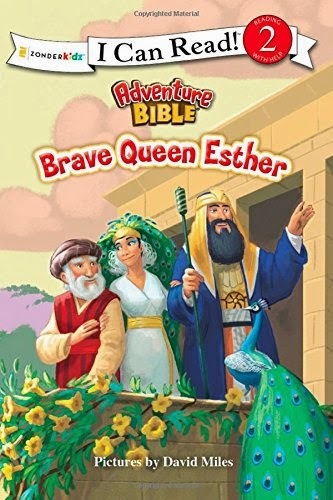 Book Review: "Adventure Bible: Brave Queen Esther"
"Brave Queen Esther" tells the story of Esther. It followed the Biblical story but left out some of the aspects of the story such as why King Xerxes was looking for a new queen. It also makes it seem that Esther was the only girl brought to the palace. It also did not say why Esther was in danger if she went to the King. When we read the story, I talked about these portions of the story that the book did not cover. It is nice to have books that I can let my children read and know that it is teaching truth. It is a Level 2 reader which stands for "Reading with Help-high interest stories for developing readers". The illustrations were beautiful and reminded me of colored pencil pictures. Many of the pages are completely covered with color making the book visually appealing. At the end of the book is a "People of the Bible" section that tells a little bit more about Esther and Mordecai and a "Did You Know?" section that tells about the festival of Purim. 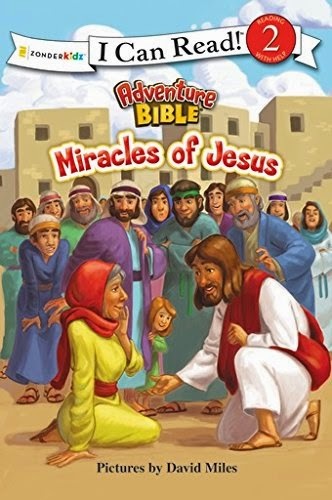 Book Review: "Adventure Bible: Miracles of Jesus"
"Miracles of Jesus" tells about some of the miracles of Jesus. It has two chapters. The first tells the story of Jairus' Daughter. This also included the part of the story where the woman touches Jesus' robe. I found it to be Biblically accurate. The other chapter tells of the Feeding of the 5000. It also followed the true story in the Bible. I am glad for stories that I can let my children read and know that it is teaching truth. It is a Level 2 reader which stands for "Reading with Help-high interest stories for developing readers". The illustrations were beautiful and reminded me of colored pencil pictures. Many of the pages are completely covered with color making the book visually appealing. At the end of the book is a "Did you Know?" section that lists some more of the miracles Jesus performs and a "Words to Treasure" section that gives a Bible verse. 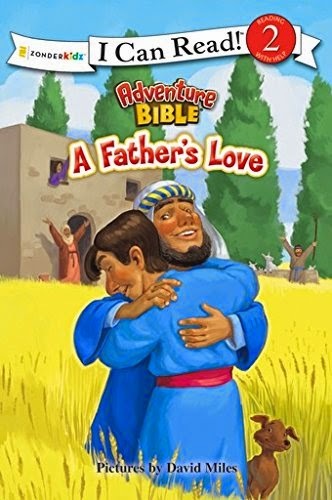 Book Review: "Adventure Bible: A Father's Love"
"A Father's Love" tells the story of the Prodigal Son. I found it to be Biblically accurate. 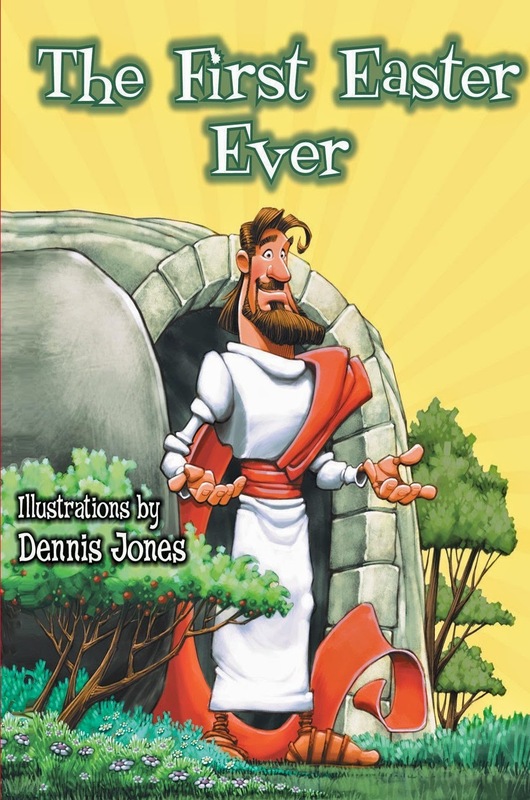 I can feel secure in letting my children read this story and know that it is teaching truth. It is a Level 2 reader which stands for "Reading with Help-high interest stories for developing readers". The illustrations were beautiful and reminded me of colored pencil pictures. Many of the pages are completely covered with color making the book visually appealing. Original "Stow and Go" seats! Is that Energizer light original?